she taught me to swim. Magnetic! This is movement of childhood stolen. Even though she attempts to recapture the moments that were carefree and filled with laughter, it is difficult. She’d rather die than live the life she is force to replay in her head… In spite of it all she teaches her daughter to dream. 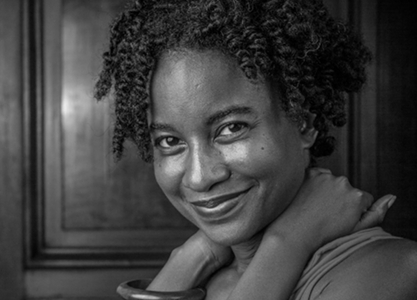 Mariahadessa Ekere Tallie is a writer, educator, and performer. She has been a featured speaker at universities, festivals and events throughout Europe and North America. She is the Poetry Editor of the literary magazine African Voices. Her work deals with silence, sexism and racism and it has been published in Crab Orchard Review, BOMB, Paris/Atlantic, Go, Tell Michelle (SUNY), Listen Up! (One World Ballantine) and Revenge and Forgiveness (Henry Holt). Tallie’s work has been the subject of a short film “I Leave My Colors Everywhere.” Her first collection of poetry, Karma’s Footsteps, was released by Flipped Eye Publishing in September of 2011. She is the recipient of a 2010 Queens Council on the Arts grant for her research on herbalists of the African Diaspora. She has taught literature and composition at York College and Medgar Evers College in New York City.